The holidays are upon us, and as that season blooms green and red and angel-sparkly in our home, I’m pleased to introduce Margaret of Scotland, refugee, queen and saint, in my novel, Queen Hereafter: A Novel of Margaret of Scotland – newly released in trade paperback from Random House and Broadway Books. Writing a novel about a medieval saint is not the easiest thing to do, as I discovered once I began researching and writing the book. I had written about a medieval queen in my novel, Lady Macbeth; and I had certainly plenty of historical romances (as Susan King and Sarah Gabriel). But a saint? That was a new challenge: all that devoutness and devotion, all that goodness and virtue. As any writer can tell you, a truly well-behaved character can be a lot harder to write than the feisty ones. Margaret has been called by historians one of the most fascinating and complex women of the 11th century and indeed the whole medieval era. She and Malcolm were complete opposites—the young educated cosmopolitan princess accustomed to charitable deeds and luxury surroundings, and the brutish, undereducated warlord raised in a savage warrior culture. Her personal confessor and friend left a rare medieval document in his biography of her, in which he describes her piety, her prayerful devotion, her perfection and compassion—and he mentions her temper, her sense of mischief, her pride, affection for friends, and strict demands of herself. Despite his idealism, Margaret’s monk, Turgot, provides glimpses of a vital, unique young woman. She respected her tough husband, taught him to read, chided him for his table manners; he adored her, had her favorite book rebound, translated Gaelic for her when she hotly debated with his priests; she fed orphans from her own spoon, stole gold from her husband’s treasury to buy food for the poor, and released his ransomed prisoners; he called her his little thief, boasted of their sons, and begged her to stop fasting. The fairy tale aspects of her true story are so genuinely the stuff of romance that I could not resist, and had to write about her—a beautiful exiled princess, a shipwreck, a brawny king and love at first sight; a tempestuous but adoring husband, eight healthy, well-behaved children, a deepening mutual love and the growing affection of the Scottish people. Yet as loving, fortunate and intelligent as she was, Margaret worked herself to exhaustion on behalf of the needy, and fasted with such severity that even the priests told her to eat something. My challenge was to take the various historical facts and many medieval myths about Margaret and spin them into fiction. I wanted to unravel what was known and piece together a new puzzle to make Margaret a real young woman for the modern reader, vulnerable and accessible, rather than just saintly and perfect. 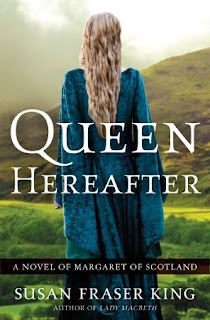 Aside from their political, social and historical significance, the remarkable Queen Margaret and her King Malcolm prove that love blooms in the most unexpected unions, and that not all royal marriages were simply convenient. The story of Margaret and Malcolm is one of a beauty and her beast, two people who changed the course of Scottish, and medieval, history. I hope their romantic story (and that gorgeous cover!) will find a place on your bookshelf, and in your heart, this holiday season. Thank you, Susan, for sharing with my readers!